Hardcover: Doubleday, 2001; Paperback: Anchor Books, 2002. Through vivid descriptions of historic battles, Victor Davis Hanson hones in on the cultural values that have enabled Western armies, often vastly outnumbered and far from home, to triumph over other civilizations. The author delineates the characteristics of successful armies — including individual initiative, superior organization and discipline, access to matchless weapons, and tactical adaptation and flexibility. Then he shows how these characteristics develop and flourish as a result of such traditional Western institutions and ideals as consensual government, free inquiry and innovative enterprise, rationalism, and the value placed on freedom and individualism. 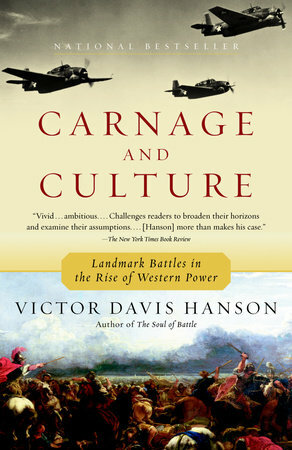 A graphic retelling of military battles from the Greek's victory at Salamis to the Vietnam War, CARNAGE AND CULTURE is also an important contribution to our understanding of the rise of Western power.